Excellent service for our recent 5 night stays in the Mahoora Elite tent. Great food, cocktails before dinner at various outdoor locations! Our first stay in tents on Safari and what a brilliant choice. Mahoora Mobile Tented Safari Camps offer you the chance to experience an adventure which will dazzle, inspire and astonish. Choose from many locations and enjoy them with a team of individuals who set the benchmark for safari camping in Sri Lanka. Not only do we offer locations in areas of beguiling remoteness, but to suit differing requirements. Mahoora offers you the choice of three different Camping Options Elite, Premium and Explorer. Whatever your preference, we can tailor-make a wildlife holiday just for you. Go on a wildlife holiday with us and experience the legend that is Mahoora. MAHOORA TENTED SAFARI CAMPS provides spacious tented accommodation. They are divided into two categories as MAHOORA ELITE & MAHOORA PREMIUM. MAHOORA ELITE is set with a touch of luxury, providing more space for guests who prefer comfort during their stay. MAHOORA PREMIUM is preferred by guests who are looking for satisfying comfort with nature. 1. We are the world’s first and only Carbon Neutral Safari Camp. We provide the most ethical and environmentally friendly accommodation options in the country. 2. Mahoora is a completely mobile safari camp option and thus gives clients a true safari camp experience. All luxuries we offer are in relation to the mobile camping concept. 3. Mahoora has the largest pool of professional naturalists in the country. This allows us to guarantee that an exclusive naturalist can be provided for each group. We provide exclusivity so that our clients’ interests are safeguarded. 4. Mahoora owns the largest pool of own modified safari jeeps in the country. We guarantee an exclusive safari jeep for each group. These jeeps are specially modified with comfort and the maximum game viewing / photographing possibilities in mind. 5. We provide the largest tents. The Mahoora Elite tent is the most spacious tent among all safari camp tents (including mobile and fixed tents) in the country. It has plenty of space and all amenities required for a very comfortable stay. 6. We are the only safari camp that offers a high-end sit down meal service. We serve a five-course lunch and a seven-course dinner. Every meal is an experience on its own, with food being cooked in your presence. The menu is customised based on clients’ preferences with our own signature dishes. There are no buffets. 7. Value additions : Mahoora has a variety of value additions on offer to its customers at no additional cost. Local Cooking lessons and experience, night walks, night safaris, warm water foot therapy, kids’ activities etc. are all included in the price. 8. 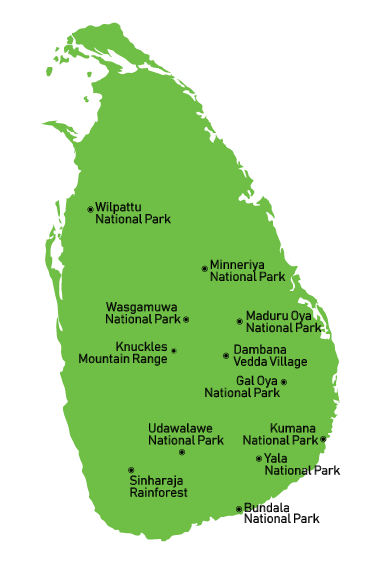 Locations : Mahoora campsites are located either in exclusive mini private reserves bordering the parks (in Yala / Udawalawe / Wilpattu / Minneriya) or inside the national parks (all other parks). 9. Pioneering and most awarded : Mahoora is the first to start the tented safari camp concept in Sri Lanka and remains its most awarded brand in the category. We have won many national and international awards including presidential awards. Mahoora Yala has been recognised as one of the 10 most romantic safari camps in the world (reference Huffington post). 10. Price : Above everything else, Mahoora Tented Safari Camps provides a "best price guarantee". Once you experience Mahoora, you will understand that pound for pound, we provide the best value in the industry. Sri Lanka is a land like no other. that have contributed to what she is today.